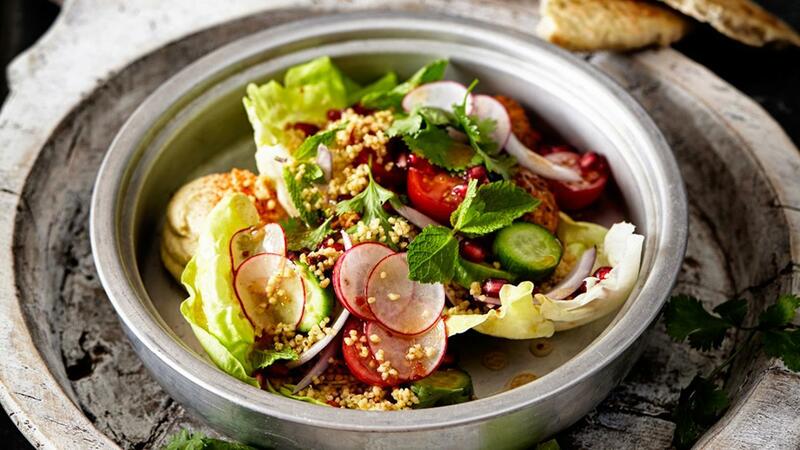 A twist on the Lebanese classic, this salad by is packed with fresh herbs and crunchy pomegranate. It's healthy, quick and rich in flavour and texture. Clean the lettuce and thinly slice the radishes. Slice the mini-cucumbers and the onion. Half the cherry tomatoes and clean the pomegranate. Put the lettuce leaves on the plates and fill with couscous. Divide the falafel over the plates. Put the hummus in a piping bag and make little dabs next to the couscous. Sprinkle with paprika. Divide the tomatoes, cucumber, radishes and red onion over the salad. Garnish with mint and coriander leaves and pomegranate and pour the dressing over the salad. Toast the pitas and serve the salad with the warm bread.